A 10% discount was available to VPA Members attending either workshop. An additional discount was available for those wishing to attend both days. It’s hardly necessary to spell out HDR as “high dynamic range”: HDR is now widely available in consumer electronic devices, and program delivery in HDR is now commercially important. But HDR comes with challenges: standards are incomplete, equipment is immature and operational practices are at an early stage. Charles Poynton has presented color science topics in Vancouver fairly frequently in the last several years. For this event attendees had a very good grasp of colour science for Digital Cinema and HD/UHD. Charles presented an advanced-level course specifically concerning the challenges of HDR in grading, mastering and delivery. In the afternoon, Charles was joined by colour pipeline advisor, Chris Davies. The pair demonstrated display calibration and discussed related aspects of colour science, such as observer metamerism and current HDR display limitations. New cameras – and new “colour science” firmware for existing cameras – are being released every month. New workflows are being introduced, and new demands arise for integration of CGI/VFX. Charles Poynton has presented color science topics in Vancouver fairly frequently in the last several years. For this event attendees had a very good grasp of colour science for digital cinema and HD/UHD. Charles presented an advanced-level course on camera colour processing. He also presented the colour science that underlies the relationship between still and motion camera characteristics and CGI/VFX. VPA 3rd ANNUAL HOLIDAY CELEBRATION! For those new to the industry, or students looking to get a headstart on joining the workforce. This roundtable offered tips, guidance and thought-starters to help attendees prepare for and navigate the freelancer labour market. Discussions included the freelance landscape and where the entry level positions are. Included 1st drink & complimentary appetizers. Price included 1st drink & complimentary taco bar. If you became a member the Fiesta was on us! Price included 1st drink & complimentary BBQ dinner. If you became a member the BBQ was on us! This exclusive opportunity to peek behind the curtain. was experienced up close and in depth on how a first class music soundtrack is planned, produced and scored for film and television projects. 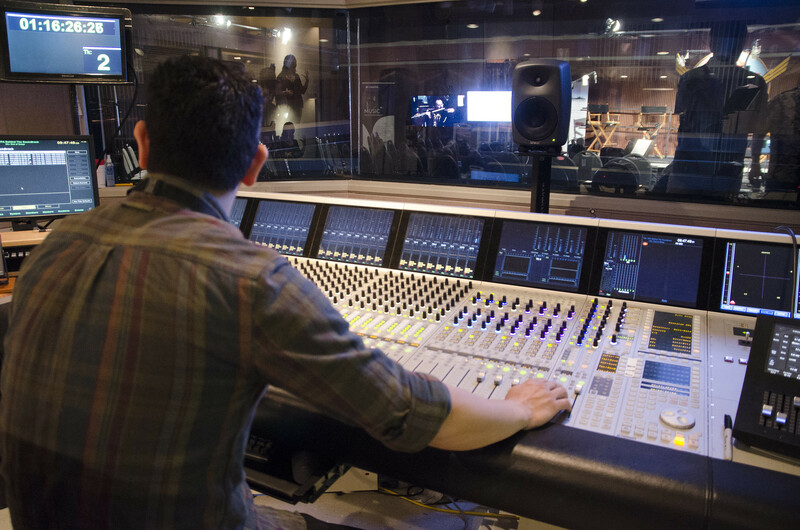 Through an all-day seminar conducted at CBC Studio 1, a premiere orchestral recording studio, we gained knowledge and insight from several panels of experienced industry insiders. At the end of the day, we witnessed the process come together with a live orchestral string recording session. On Monday February 29th, Soho Bar & Billiards - 1283 Hamilton Street Yaletown, hosted our Leap Year Social. Complimentary snacks and billiards were included with admission. On Saturday January 16th, 2016 at the VIFF Vancity Theatre, the VPA hosted an informal presentation and conversation with William Steinkamp, Oscar nominated American film editor with more than 30 major film credits spanning his 35 year career. Mr. Steinkamp offered his insights and anecdotes on the essential points of the craft: understanding an actor’s performance, script, music, pace, continuity, and the collaboration process with the director. Steinkamp had a longstanding, notable collaboration with director Sydney Pollack, editing nearly all of Pollack's films from Tootsie (1982) through the director's last film, The Interpreter (2005). He also edited several of director Gary Fleder's films including Kiss the Girls (1997) and The Express (2008), as well as The Fabulous Baker Boys directed by Steve Kloves (1989), and Scent of a Woman directed by Martin Brest (1992). Steinkamp is currently working in Vancouver on the Lionsgate feature film, The Shack, directed by Stuart Hazeldine. We celebrated the Holiday Season Wednesday, December 16th, 7pm to Midnight with the VPA by toasting this landmark year for Post Production. It was free for VPA members and the first drink and appetizers were included. Non members and guests were $25. The Vancouver Post Alliance (VPA) held an end of summer celebration at Mahony & Sons (Stamps Landing), Wednesday September 16, from 6pm to 9pm. It was a great chance to meet up with post friends and to catch up on work around town, talk tech or just enjoy the view of False Creek while enjoying a drink and some food. The event was be sponsored by G-Technology. For years G-Technology has been serving the content creation community with products that delivered on their slogan of ‘Performance. Style. Reliability’. They’ve now added ‘Community’ to that list, involving themselves in the various Post communities and groups, and helping to lay the groundwork for workflows of the future, like the world of VR. They were very excited to have had their first event in Canada be with the Vancouver Post Alliance. G-Tech’s Drive Guru Bobby Lombardi and other key members of their product team were on hand to share some of their announcements fresh from IBC, presented some workflow solutions, and, of course, raffled off some great prizes. The VPA offered members a special Mahony’s Burger and Beer deal for $10 (regularly $18)! The VPA presentation of The Art of Sound for Film and Television on Saturday June 28, 2015 was a great success. The panel of talented sound artists and moderator, Jonathan Shore engaged the full house audience with an insightful and entertaining presentation. Special thanks to our sponsors Annex Pro, Lorne Lapham and to Sharpe Sound for the use of their fine facility. All filmmakers, editors, and aspiring sound engineers! You’ve heard it said – in video and film, AUDIO is 70% of what you see! The Vancouver Post Alliance (VPA) had a panel presentation of the role sound plays in a film or television production. Designed for sound and picture editors, mixers and filmmakers, our panel of experts will cover techniques and tools that will expand your skills and knowledge of the effective use of audio in all of your projects. From effective dialogue, SFX and music editing through creating expansive soundscapes and mixes…people walked away from this workshop with new skills and concepts. The Vancouver Post Alliance had a Spring Social. The event was open to all members and non-members in film and television post production. We are looking forward to an exciting year and we started it off right on April 8th at Mahoney's in Stamps Landing. Nibbles were served and the doors opened at 6:30. After a year of organizing, inspirational teamwork and countless hours of volunteer efforts, the VPA membership has begun to take shape and is off to a great start. We held our Inaugural Social on Feb. 27 at the Dockside Restaurant on Granville Island to toast who we all are and what we are achieving. The event brought together newly joined members, and those curious to find out more, as well as BC MLA Jane Thornthwaite, whose non-stop energy has been a wonderful source of inspiration. She has been a relentless champion of the post production community for which we can't thank her enough. It was an informal night that became an opportunity to meet new people, to get to know our colleagues a little better outside the workplace, and also to reconnect with long time acquaintances and respected familiar faces, which for some, a lot of time had passed. We heard from many that this was a long time coming, and that people are hopeful for what's possible, for what we can do for each other together to create highly skilled opportunities here for British Columbians. It's going to be an exciting year, with much thanks to our Inaugural Social sponsors who celebrated with us. Congrats to door prize winners Michael Bateman and Andria Spring!